Emerging economies including Brazil, Russia, India, China and South Africa known as a growing force with the power of economy, finance and enormous potentials are considered as massive motivations affecting greatly the rest parts of the entire world. Theirs characteristics of politics, political geography and economic policy are not identical to traditional market economies in Europe and the US BRICS can be called the model of non-traditional market economy. The rise and the great effect of BRICS can change the order of the current world which has long been dominated by western nations during the past two decades. However, BRICS itself contains challenges and barriers for the socio-economic development such as hot growth, poverty, low living standards and environmental pollution, etc. The political affiliations and violence in declaring the sovereignty of seas, islands and territory reveal the latent instability that can drive to conflicts and arms race, etc. BRICS is a force without lack of necessary motivational factors that can enhance the development but also contain inside challenges and barriers for the rest parts of the modern world. Most nations nowadays comply with the model of market economy but have two distinct operations. One is the model of traditional market economy in western countries and developed nations in Northeast Asia like Japan, Korea, Singapore, Hong Kong and Taiwan. The other operates according to the non-traditional market economy in emerging nations like Brazil, India, China and South Africa called BRICS group. The 2008 global financial crisis destroyed severely the finance of western countries that have obeyed traditional economy and public debt has overwhelmed the whole Europe. In the early 21st century appeared the rather violent rise of the non-traditional economies, namely BRICS, which have had a pervasive influence not only on economics but also on global political issues. The appearance of BRICS and its growing impact is regarded as a ruler for the imperfection of non-traditional model the theories of which must be reconsidered to have a more convincing explanation of its imperfection and inefficiency when facing modern economic problems. This appearance is also expected to supplement the limited aspect of this model, so BRICS has become vital for the rest parts of the world due to the world’s largest population, the second largest in economics just after the US and the place that frequently provides the world with natural resources. However, is BRICS perfect? Absolutely no. BRICS itself is confronting numerous serious problems and its actions are worrying much many other countries. Among the nations in BRICS group, Russia and Brazil have per capita income as high as or a little higher than the one of the world. According to 2010 statistics from the World Bank, Russia made up 113.78% and Brazil was 116.73% compared with the average income of the world. This rate was even much lower in nations with dense populations like India (15.37%), China (48.26%) and South Africa (79.34%). Supposing that poverty standard is considered below USD $2 per day, the poor in India in year 2010 made up to 68.72%, equivalent to 829 million people. China, 2008, accounted for 29.79%, equivalent to 394 million people. Brazil, 2009, 10.82%, 20.9 million people. South Africa in 2009 was 31.33%, 15.42 million people and Russia, 2009, 0.05%, 0.071 million people. The overall poor population in BRICS was approximately 1259 million people, accounting for 18.26% of the world’s total population in 2010. Thus, it is clear that the majority of the poor living on earth now chiefly concentrate in BRICS, except Russia. Living in the poverty is the root of social injustice disputes, crimes and illiteracy, etc. The exploitation of children and women laborers in hard coal mines, slumps, male chauvinism, HIV disease, environmental pollution and manufacture of counterfeit products, etc. are all in BRICS. This trouble is regarded as the most enormous barrier for social progress, civilization and democracy. 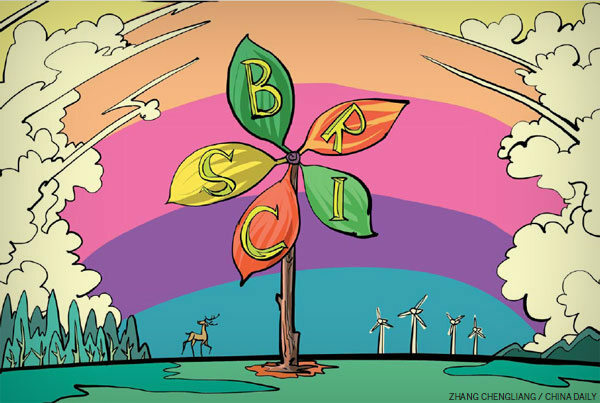 Energy for the demand of socio-economic growth is a challenge for BRICS. The electricity power consumed in 2009 accounted for 31.12% of the world’s. 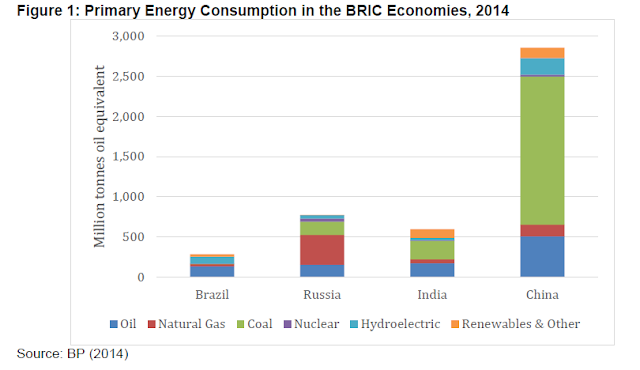 Particularly, this rate in China was 61.21% of the entire BRICS and 19.05% of the global energy. It is remarkable that the increase speed of electricity consumption is higher than the average rate of the world, especially China. This pace in 2006 compared with 2004 in BRICS was 16.94% whereas it was 8.71% in the world, and particularly China was 30.14%. The rate in BRICS was 16.02% in 2008 compared with 2006, 6.72% in the world and 21.64% in China. 4.05% in 2009 compared with 2008, 0.71% for the globe and China was 7.66%. China is growing fast, so the great energy sources are very in need whereas its petroleum sources are considered as the lowest among other countries and coal supply is also limited. Thus, it is the key reason for China to suggest arbitrarily and unacceptably the U-shaped line and trigger assaults on nations in the East Sea such as Vietnam, the Philippines, Japan Sea and Hwang Hai Sea with Korea. Political connections, disputes and arms race in the whole globe. Currently, the two nations of BRICS, China and Russia are permanent members of UN Security Council. The changing tendency of the world and diplomatic measures to reform the UN will be likely to focus mainly on expanding it by admitting India, Brazil and South Africa to this organization owing to their important roles in their own continents. The new growing axis of politics and military is shown by the relationship between Russia and China; China-Russia and their partners in Latin America and Africa is revealed by the China’s investment in most nations in Africa and Latin America, etc. On the surface, the affiliation of BRICS is merely for their self-interests but each of the nations itself, even the neighboring nations like Russia, China and India, have had conflicts and envy of each other for history, economics and politics as well. Disputes at the thousands long road border, charges against each other due to the support of protesters and the hatred of history are still problems that BRICS could hardly defeat. In contrast, BRICS is typical of the unconventional economic model with the characteristics of economic-political institutions representing for countries with emerging economy. BRICS has had a wide effect on the face of economy and commerce owing to the world’s largest population, and the second biggest economy after the US BRICS’s power has been much enhanced since the 2008 global economic crisis and the European public debt, and currently they are seemingly more powerful thanks to the massive foreign currency reserves, the export of high-valued resources and labor-intensive products with low prices. Besides, BRICS are confronting hard problems such as poverty, low living standards, environmental pollution and pressures of energy for growth. Moreover, the high rate of impoverishment but enormous foreign currency reserves is a paradox of development process, which reveals that BRICS is somewhat failing to become an ideal model for the redistribution of wealth for it's own community. On top of that, the fact that BRICS is establishing a new world order by the affiliation with economic-political-military policies that do not comply with international general rules is much worrying the modern world now.